One thing that is apparent in our Handwriting Group on Facebook is the very real need that parents and teachers struggle with when it comes to teaching letter formation. So many members of the group question how to teach letter formation. They wonder where to start with teaching kids to write letters or they are challenged by kids who have formed bad habits with letter formation. They are seeing kiddos who form letters incorrectly or don't know where to even start to teach letters accurately from the beginning. 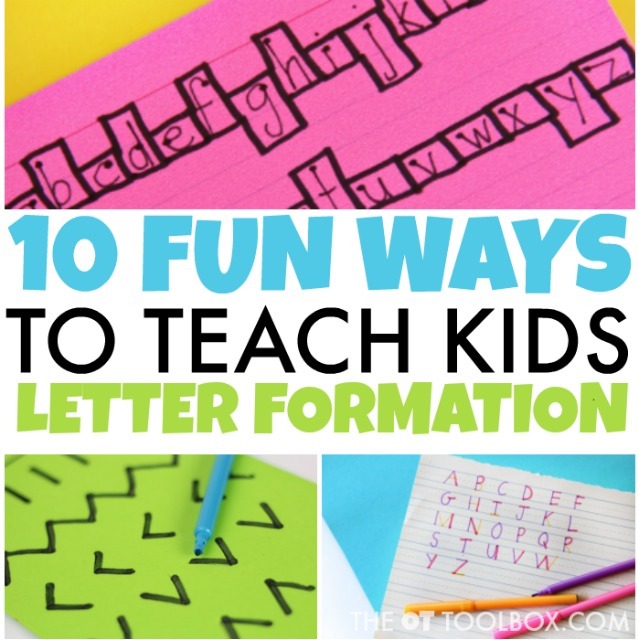 Read on to find 10 creative ways to teach letter formation whether you are starting at the beginning with a young child or are addressing those pesky bad handwriting habits that have resulted in poor letter formation and therefore, legibility. 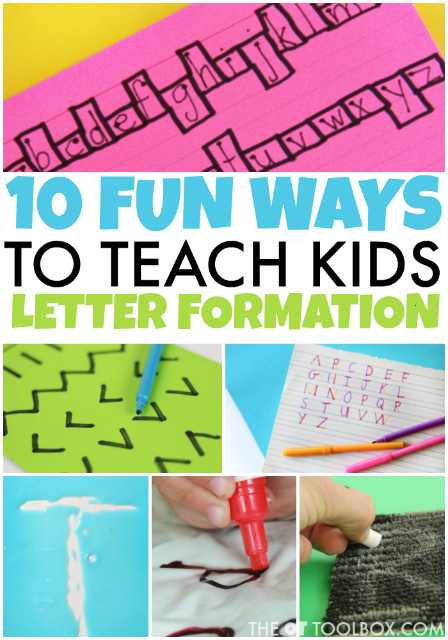 These fun handwriting activities are those that add a fresh concept to teaching letter formation. You can use these ideas to teach pre-writing skills or to work on specific letters. When using the ideas below, it's typically recommended to start with uppercase letters because of the simplified forms and letters that for the most part, start at the top and are formed in a downward pencil stroke, which is developmentally appropriate for young children. Read more about the order to teach letters like cursive letter order here. Using a non-pencil activity to teach handwriting can be the trick to get kids interested in writing! Affiliate links are included in this article. 1.) Work on letter formation by "building" letters- This is a question for some parents, teachers, and therapists. Sometimes we see children who construct letters by parts, but use inappropriate letter formation when building letters. When writing a lowercase letter "d", they might draw a circle and then draw a line, without the re-trace. Drawing or building letters can have inefficient consequences if kids are just allowed to copy letters inaccurately and without being taught. So often, we see this in those writing tray videos over on Pinterest or Facebook. Read more about writing trays and handwriting and how to use writing trays to effectively teach letter formation. Teaching kids wot build letters with proper sequence in each letter formation is essential! This color-coded letter building activity teaches kids to start at the correct starting spot and to pick up the pencil when necessary. Try this activity for those children who respond well to visual cues. Adding a kinetic twist to teaching letter formation can be just the tool that makes formation stick! Therapists love these hands-on letter parts in the Fundanoodle Letter Kit that allows kids to form the parts of letters and recognition of descriptive terms like big line, little line, big curve, little curve that many who use the Learning Without Tears program love! 2.) Teach Letter Formation with a Writing Tray- The fact is, using a sensory writing tray for handwriting is a technique to practice proper letter formation is a way to incorporate multiple senses into learning letter formation. Be sure to encourage proper starting points and direction of letter lines such as starting letters at the top and lifting the writing utensil when appropriate to form parts of letters such as the curves in a "B" or the slanted little lines in a "K". Writing trays can come in all sorts of themes, sizes, and using all types of mediums. You can even create a mini-sensory writing tray like we did. Take it along in your therapy bag or on-the-go to learn and practice letter formation anywhere! 3.) Use the Sandpaper Letter Trick to Teach Letter Formation- Use a sheet of sandpaper to work on letter formation! This multi-sensory activity uses the senses to teach letter formation, by providing feedback for pencil control and line placement. Adding a quick sheet of sandpaper to your therapy toolkit is an easy way to work on letter placement by adding additional prompts to handwriting. 4.) Teach Letter Formation with Soap- Kids can learn to write letters in shaving cream, soap, and even pudding! Using multi-sensory strategies to work on letter formation can help kids remember the proper formation. So often we see strategies that are taught in isolation and then not carried over to the classroom or home. When a child is asked to write with increased speed or in a distracting environment, we may see letters that revert back to those bad habits. Adding sensory activities to letter formation such as writing in soap, shaving cream, or sandpaper can provide the feedback kids need to add just one more cue for formation. Remember to provide instruction in proper letter formation and line placement and not just setting up a child with an activity and then letting them "play and write". 5.) Teach Letter Formation with Gross Motor Play- Sometimes, adding a movement component to teaching letter formation can be all it takes to make letters "stick"! There are so many options for adding gross motor to letter formation. These Upper Case Letter Muscle Mover Cards provide an opportunity to learn letter formation with gross motor movement. Each card has an uppercase letter on one side and a corresponding animal and gross motor activity on the other. Includes an O-ring for storage and a dry-erase pen. There is also a lower case version of these muscle mover cards that promote optimal letter formation for the lowercase letters of the alphabet. Both versions are laminated cards that are very durable and can be used with dry erase markers, wiki stix, and play dough to practice forming letters. Use the muscle mover cards for fun “brain breaks” to get the kiddos up and moving while teaching letter formation. 6.) Teach Letter Formation on an alternate surface with a sensory bag- Fill a sandwich bag with soap, foam, or other liquid material and practice letter formation. You can even tape the sensory bag onto a wall or window to practice letter formation. Read more about how to create and use a sensory bag to teach letter formation in this older post on sensory handwriting. 7.) Use a resistive surface to teach letter formation- The motor plan needed for letter formation can occur with practice on a resistive surface. We've shared ideas to teach letter formation on resistive surfaces such as using carpet squares or carpet scraps, a styrofoam tray to learn letter formation, and foam sheets to teach letter formation. 8.) Teach Letter Formation with the "Ghost Writing" Trick- Have you tried the ghost writing trick to teach letter formation? It's a fun way to explore the pencil strokes needed for letter formation as well as skills needed for legible handwriting and pencil pressure in written work. 9.) Use Boxes and Dots to Teach Letter Formation- This box and dot letter formation trick also helps kids learn letter size or spatial awareness in written work. It's also a tool to help kids who struggle with letter reversals. You can make your own paper or use graph paper to create a quick practice tool for teaching letter formation. 10.) Help kids learn to write with a Kinetic Letter Formation- This is fun kinetic fine motor activity is another spin on adding resistive input and a motor component to letter formation, all using recycled materials or objects found around the home. Use a recycled can and push pins to teach letter formation while improving hand strength and fine motor skills. Do you have any letter formation activities that you love to use when teaching handwriting? Tell us about them! There are over 6,000 members in the Sweet Ideas of Handwriting Help Facebook Group that love sharing ideas to work on handwriting.